It doesn’t take a rocket scientist to quickly divine both the production values and the heightened characterizations in the National Geographic channel’s humanizing of Albert Einstein. Adapted from Walter Isaacson’s Einstein: His LIfe and Universe, the 10-part Genius is anything but a plodder. Principal executive producers Brian Grazer and Ron Howard (who directs the first episode) clearly are intent on making Einstein’s life “accessible” without turning it into physics for dummies. Based on the two episodes made available for review, their efforts are adding up to something pretty special. National Geo’s previous scripted efforts have mostly amounted to adaptations of Bill O’Reilly’s Killing books. 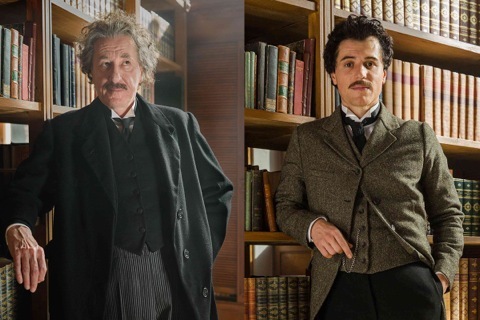 Genius easily is the network’s most ambitious undertaking to date, with Oscar-winner Geoffrey Rush (Shine) and the comparatively unknown Johnny Flynn respectively taking turns as the older and younger Einstein. The series repeatedly bounces around, but coherently so. And in the early going at least, Flynn’s performance is the more interesting and affecting while also consuming considerably more screen time. His formative, rebellious and devilishly handsome Einstein is beset by an unyielding father and hidebound professors while otherwise being torn between two very different women. Blonde, beautiful Marie Winteler (Shannon Tarbet) is instantly smitten with Einstein when he comes to live with her family in Switzerland. She’s also bright and rather poetic, but has no interest in physics. Plainer Mileva Maric (Samantha Colley), born with a lame leg, initially has no use for him. But he’s intoxicated by her mind and kindred passions for science and mathematics. Colley is first-rate in this role, and her wars of will with Einstein are the best parts of these early chapters. Rush’s older Einstein has gone on to marry Elsa (Emily Watson), who very much wants to vacate Germany in the face of Hitler’s nascent Nazi Party. “If we leave, they win,” Albert protests. The script for Genius can be standard-issue at times, but not enough so to cause any major damage. Throughout, Einstein’s unchained mind is both rebuffed and encouraged. But his father, Hermann (Robert Lindsay), remains unyielding in his efforts to squelch his son’s independence. At the end of one of their blowups, Albert declares, “I am going to be a professor. I will think for thinking’s sake!” Imagine that. Mileva in contrast has a supportive father and a naysaying mother, as flashbacks show. Ridiculed by young schoolmates for her pronounced limp, she’s determined to conquer a man’s world via sheer will, persistence and brain power. “Flirting” decidedly is not part of that game plan. “Stay away from me!” Mileva exclaims when Einstein gently puts his hand on her shoulder during their early days as students at Zurich Polytechnic. But physics and physicality eventually intersect during some of Genius’ very best moments. The production is filmed in Prague, and the vistas can be stunning. Nothing looks as though it were done on the cheap. So the bigger your HD screen, the better. Rush’s older Einstein undoubtedly will take a firmer hold in later episodes. Earth’s most renowned physicist died at the age of 76 in 1955. The first two back-and-forth episodes of Genius get only as far as 1932, with Rush first taking the baton from Flynn a decade earlier. Genius may be the production that puts National Geo on the map, so to speak, assuming it progresses as impressively as it unfolds. The network already has announced plans for a second season under the umbrella Genius title, but with a new big brain as its focus. For now, getting inside of Einstein’s head is quite a daunting undertaking. And National Geo passes the early exams.